Watch videos from the Word of Truth Conference 2015 click here. We also elected Mr. Nathan Johnson to our Board this year. Nathan resides in the Minneapolis, Minnesota area, where he has been a Bible student and teacher for a number of years. Most importantly, he has been a student of Otis Q. Sellers’ studies and we look forward to his contributions to the longer term outreach of this Ministry. In addition to Nathan, Robert Juneau and Louis Tonetti were also elected to the Board, as we look to the future. The Board now consists of Jane Hancock, Robert Hammond and Messrs. Johnson, Juneau, and Tonetti. Rusty Hancock remains as Office Manager (pays the bills, etc.). Milt Hammond volunteered to step aside to permit these new people onto the Board. We thank Milt for his many years of devoted Bible study and support to this Ministry. He remains as the senior Bible studies adviser to this Ministry, together with the assistance of his daughter, Joanne Johnson. Louis Tonetti and Nathan Johnson collaborated to reformat/recompile Mr. Sellers excellent studies of this Book to make the reading somewhat easier to follow. We thank them for this addition to the “Ephesians Study”, and hope you will enjoy this, also. Click here to view this study. Has now been placed for FREE viewing by all interested people. A Biblical Education for Free! You are invited to enjoy with us the freedom and pleasure of exploring Biblical Truth. We live in a time when sound doctrine is not taught and many people are desperately searching for the Truth of God. We believe that the Bible is the verbally-inspired Word of God, the final authority regarding what is the Truth. Although there may seem to be apparent conflicts within this Book, they exist either because we may not fully understand, or the translation may not truly represent the original ancient Hebrew or Greek. So we study to show ourselves to be workmen who do not need to be ashamed, rightly dividing the Word of Truth (see II Timothy 2:15 ). You will need the free Adobe Acrobat Reader in order to view these written studies. Who really crucified Jesus Christ? Do you have hope in resurrection? Have you heard of Christian Individualists? Is Heaven our future home? The Word of Truth Ministry (www.seedandbread.org), founded in 1936 by the late Otis Q. Sellers, has as its sole purpose the presentation of well-studied Biblical information. We also strive to help/encourage anyone interested in knowing more about what the Bible truly contains, as contrasted with what some would have us believe it contains. The Word of Truth Ministry is non-denominational. It has no “members, ” no one can join it, no one can be “disfellowshipped” from it. It has no rituals. Our Ministry has distributed thousands of copies of Bible study materials over the years. At the present time we still send out printed materials to our faithful readers without internet access. However, we can now offer these studies to our internet readers via secure online shopping. Readers can download the materials or order CD’s which will be mailed when the order is received. At the time of his death in 1992, age 90, Otis Q. 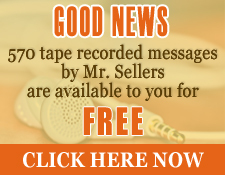 Sellers had proclaimed the Word of God on radio, had written pamphlets/booklets, and newspaper articles, and recorded on audio tape 570 Bible study messages. We have placed all of his 199 Seed and Bread messages onto this site. They are yours to use in your studies of the Bible and your search for the Truth of God. You will quickly learn that Sellers does not just “skim the surface” when it comes to Bible study but pursues the Hebrew and Greek words until he has finally wrung out their true meaning(s). While we appreciate, and need your financial support to this Ministry, profit is secondary to our getting these studies out. Mr. Louis Tonetti, Bible student, makes Mr. Sellers’ groundbreaking studies of Ephesians even more clear. Click here to proceed with the reading.